These days outdoor kitchens and lavish outdoor entertainment spaces are increasingly popular. Of course, the best ones have some sort of centerpiece or impressive conversation starter to wow guests. Sure, you could go with a puddling water feature, a lighting array, or a fancy enclosed water feature for some visual flair. Still, all those options are more decorative than functional. What really captures the attention and stimulates the senses is a high-end grill. 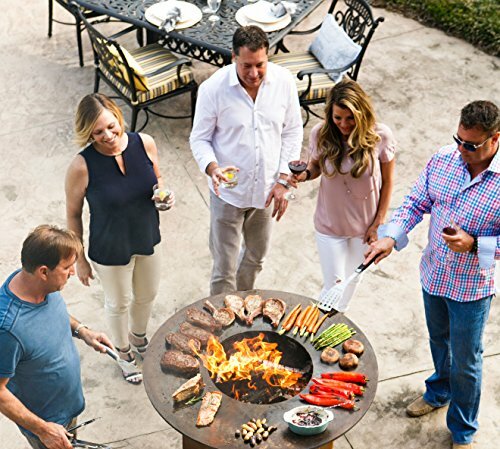 Arteflame takes the concept of a high-end outdoor grill and pairs it with durability, versatility and a sleek, elegant look. 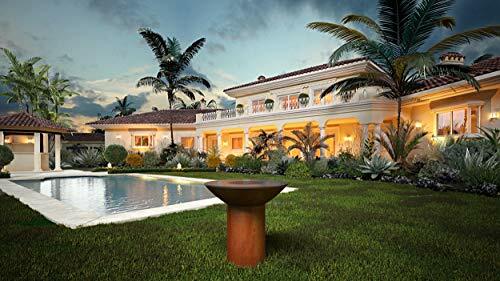 The central pedestal base rises up to support the large 40-inch fire bowl, which has an 18-inch center to host charcoal or natural wood fire. As it burns heat is transferred to the steel ring, which can act just like a griddle for just about anything you want to sear off. The accessory ring surrounding the 18-inch center can host a rotisserie, traditional cast iron grill grates or risers. It can be used as a grill, or if you prefer from time to time you can just use it as an eye-catching fire feature. When it’s not in use you can even cover it with a high-quality table cloth to use it as a standard pedestal table. 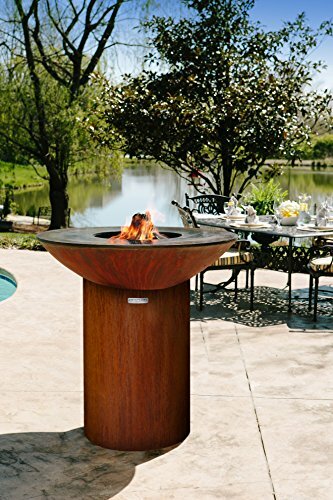 Arteflame is also made in the USA with steel sourced directly from the United States. It stacks together easily for quick assembly. Just keep in mind that when fully assembled it will weigh in excess of 150 pounds. 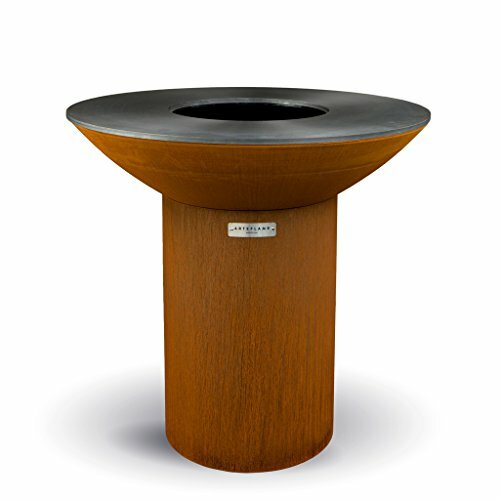 Made with US steel in the United States the Arteflame 40-inch Classic is a paragon of quality as well as pride in workmanship. It was designed to live outdoors throughout all four distinct seasons. As time goes on the carbon presence in the steel will also allow it to develop a visually attractive patina. This is assuming you take the time to clean it properly after every use and wipe down the exposed steel top with food grade oil soaked into a paper towel. The Arteflame 40-inch Classic is very easy to assemble assuming you have a strong-backed friend or two who are ready to pitch in. The heavy sections stack together nicely to hold firm. One thing you will have to address when you first assemble it is that the cooktop needs to be seasoned. This is a layer of heat cured hydrocarbons that protect the underlying steel, while also giving it semi-nonstick properties, as well as little flavor enhancement. Just follow the seasoning instructions in the owner’s manual. Depending on the accessories you want to use, the Arteflame 40-inch Classic blends the appeal of rustic open fire grilling with an elegance not seen in many other grills. 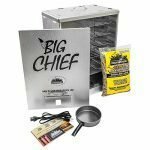 You build a robust charcoal or natural wood fire in the middle of the 18-inch ring. As it continues to burn the flat cooktop surface absorbs more and more heat. This is where rustic creativity comes in. The flat cooktop can be used to make anything you would use a normal griddle for. If you like it can be used to sear steaks, burgers, and bratwurst. It certainly does an amazing job of sautéing vegetables like peppers, onions, and asparagus. 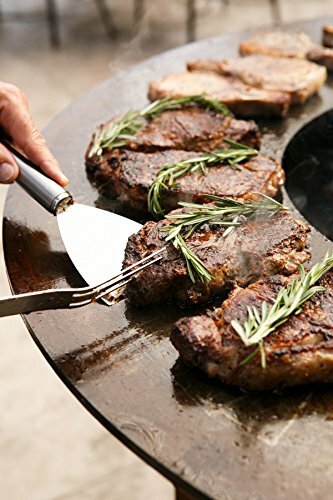 If you like you can then place the cast iron grill grate over the center of the circle to grill meats directly over the fire. The whole set up begs you to make some world-class fajitas. You can even warm and soften store bought tortillas on the flat cooktop or make your own from fresh, fine ground masa. Of course, let’s not look past the accessory rotisserie, which is well worth the money. It is designed to lock firmly onto the accessory ring. It has a battery-powered electric motor that drives the counterbalanced roasting spit. There are three different height settings that the spit can be set at, depending on what you want to use it for. Now, I know the first thing you think of when you hear the word rotisserie is chicken. And this rotisserie does a great job of preparing chicken, small turkeys, Cornish game hens, and even the occasional duck basted in orange glaze. One area where the rotisserie really shines is for making things like classic Middle Eastern lamb kebabs, and Chicken Schwarma from stacked boneless chicken thighs. And don’t look past the opportunity to make tacos El Pastor, from freshly grilled tortillas. 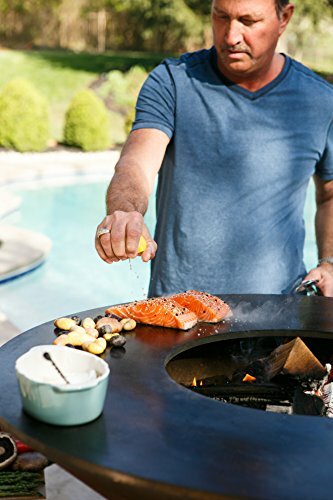 When you consider the central fire ring with its grate and the primary outer flat cooktop ring, the Arteflame 40-inch Classic provides a staggering 1,256 square inches of cooking space. If you need a warming rack you can improvise with a wire basket and some heavy-duty aluminum foil. 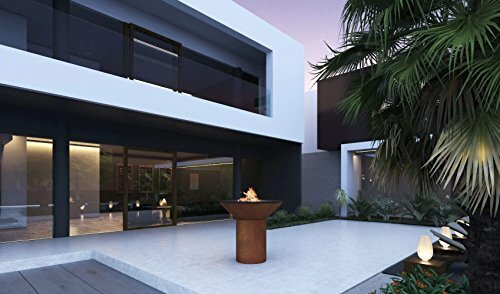 The Arteflame 40-inch Classic doesn’t necessarily have any amazing special features beyond the way central ring supports a range of accessories. 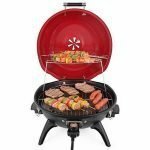 That being said, the grill grate, the risers, and especially the rotisserie are all must-haves to take this unique grill to the max. The Arteflame 40-inch Classic does take a little bit of extra care, just like any quality item. After every fire session, you will need to scoop the ash and any spent coals out of the fire bowl. The flat top surface will need to have any lingering material scraped away. Arteflame sells a special tool that makes this easier, but really you could get by with a quality, metal edge board scraper that you can find at any kitchen supply store. Once the flat top has been scraped down, you should give it a thorough wipe down with a food grade oil. Arteflame gives you some suggestions in the instruction manual, flaxseed oil is likely the best. The Arteflame 40-inch Classic comes with a 3-year limited warranty, which is par for the course for a large, high-end grill of this magnitude. Still, it would be nice if they stepped up to the plate to offer a five-year warranty. 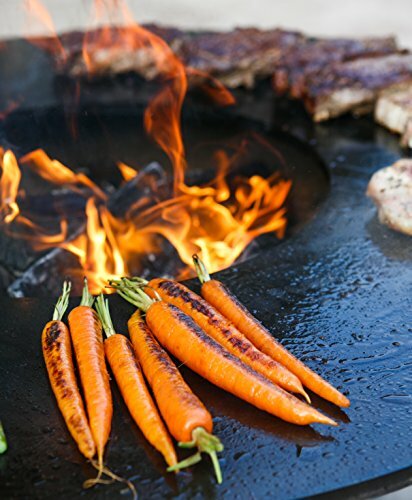 If you are looking for a backyard cooking experience that is sure to turn heads and impress guests, then the Arteflame 40-inch Classic should be on your radar. Just keep in mind that it’s a high-quality item, and as such you need to take care of it after every use. Investing in the accessories like the rotisserie and the cover top will help release this unique grill’s full potential. Simply Stacks Together in Minutes, No Complex Assembly.